Is it speed? Is it Velocity? Is it Acceleration? These review cards are cut in advance by the teacher(laminated for longer life). There are 12 cards. This activity would be great for review work in pairs. 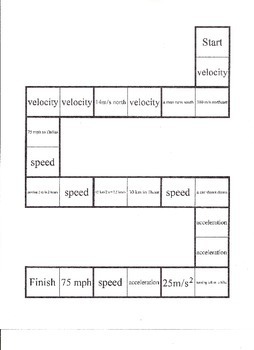 There are cards for speed, velocity and acceleration. Each matches another card with an example of speed, velocity and acceleration. "A car drives 30 mph north" would match with velocity. 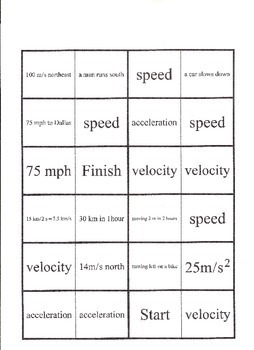 This activity aligns with TEKS 8.6B Differentiate between speed, velocity and acceleration.